Children learn by example. The other day I was in the car with my twelve year old daughter and out of nowhere she said, “Mom, you are a really forgiving person.” My body was filled with chills from her words. It wasn’t like I’ve been trying to preach forgiveness to her; I’ve merely been walking my path knowing that she is paying more attention to my actions than my words. It touched my heart that she would bring this up and it opened a door for me to explain something valuable to her. “Thank you for saying that. I am a forgiving person. I always have been a forgiving person. It comes very naturally to me, but not everyone forgives very easily.” She was listening so I went on. “I learned a long time ago that it takes much more energy to remain angry than it does to simply let things go. And if I’m angry, then I’m the one who is suffering. When you forgive, you set yourself free. When you stay mad, it’s like drinking your own poison, or deliberately swallowing hot coals. I really don’t want to waste my life being angry or jealous toward other people. It’s much easier to just forgive. Life is too short.” She took my words in and we talked about it for a little while. She gave me an example of where she observed me being forgiving. She sat silent afterward and I wondered what she was thinking about. Perhaps this was a moment in her life where she would deeply understand the precious value in forgiving a friend for hurting her feelings. We derive from a Christian family, and she is very receptive to what the Bible says, so when I talk to her about my way of life, I always refer to the teachings of Christ. I don’t care what the Hebrew laws were in the Bible. I certainly do not take the Bible literally. I don’t pay much attention to the words of his followers after Jesus ascended. Very few people understood his message, including his disciples who also took his words literally. His message was simply compassion, which has been the message of all the major prophets throughout history. When I explained to my daughter about forgiveness, I referred to Christ’s very simple message of compassion. Learning compassion is a way of life. It is not an easy way to live, yet it is the most simple way to be. There are a lot of things we could all be angry about, but how many times have we wronged others and screwed up in our lives? How many second and third chances have we been given? I’ve even heard so called spiritual people say things like, “Forgive but don’t forget.” There are all kinds of philosophies around forgiveness, but when you live a life in spiritual freedom, and you understand that your entire walk in faith is about constantly letting go (of everything), it won’t matter how people behave because you won’t be trying to get something out of them. You won’t be plotting your life out, trying to impress others, looking for acceptance, or making things happen the way you want them to occur. Most importantly, other people’s behaviors will not affect you. You will simply wake up in the morning without thought of yesterday or worry of tomorrow. You will live your day according to how it pans out and talk to people who come into your experience, while being present with them. You learn not to get caught up into any drama, which is happening all around you, yet you will be so aware of it that it’s impossible to get snagged into it. Often I play along, but I’m only playing along. Situations that arise between people are not real to me. The truth lies somewhere between the lines of physical reality and emotion. I pay attention to arising emotion, and if there are no emotions arising, then I am able to partake in dialogue without being a participant in the drama – kind of like an actor. Most of the time because I’m not interested in the drama, other people don’t include me in it, which makes my life a hell of a lot easier. I also don’t go around planning things any longer. If people want to spend time with me, I’m open to that. It doesn’t matter how they are as a person. I simply don’t care. I’m not trying to get anything out of anyone. I just walk in my spiritual freedom and let things flow through me without any agenda, which gives me the freedom to not be hurt by others. And when I do find myself with an agenda, I take a step back and let go again. I used to be a really controlling person. I wanted things to work out a certain way. I wanted others to feel a certain way about me. I based the way I felt by how people responded to me. That’s a really high maintenance way to live. Who has time and energy for that? I suppose it’s because I’m getting older and I’ve grown up a bit, but whatever the case, I simply do not put much thought into daily situations (sitcoms) any longer. If I’m faced with intense drama, I try to deal with it as soon as possible, but above all else, I let things go. In fact, I let things go so quickly now that I forget why I was even mad toward another person. Being mad at someone is like carrying their weight around while they are out there living their life. It’s really pointless, and toxic to your body. Being angry and remaining stressed or hurt places your body in an acidic state, which is cancerous. Forgiveness and letting go keeps your body alkaline, which is healthy. If anything, forgive others for your own health! Forgiveness for some people is not an easy thing to do. If this is the case for you, might I suggest that you look at your life situation and see how many people are taking up space in your head. I would guess that there are plenty, which is indicative that there is a great opportunity for you to practice forgiveness right this very moment. We are always offered opportunities to grow and to practice spiritual freedom by the way the world and people respond to us. Most of the time we are blind to this so we react. We are incredibly ignorant about the inner journey of life. We don’t see that the world is staged for our spiritual and emotional development. If people in your life are constantly bringing up anger for you, then they are simply reflecting what you need to work on within yourself. They are not your enemies. They are your teachers. Once your lesson is learned, they will either move on from you, or you will become the best of friends. I know this from experience. Take the opportunity to practice forgiveness –or don’t, and remain on the merry-go-round. I don’t like preaching forgiveness – I simply live it and don’t put too much thought into it, but I felt it was relevant today because it is an important way to respond to life, especially in recovery. Sometimes I read someone’s blog, or watch a YouTube video that is so parallel to what I’m facing in my life – so when a topic comes up for me as I’m about to blog each morning, I write about it knowing that someone out there will relate. This came up for me today, so here it is plain and simple. 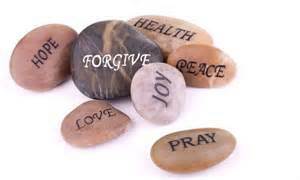 Forgiveness is not easy for everyone, but it sets you free, so I highly recommend it. There are plenty of opportunities to practice forgiveness, and once you learn it and become it, you will discover that people won’t prod and poke you toward your anger any longer. Keep walking the internal journey and noticing that the outside circumstances are there to point you in the right direction – right back to yourself!